Small bore rifle silhouette requires the shooter to knock the metallic silhouettes off the rails at 40, 60, 77 and 100 yards using a .22 cal rifle. In a series of relays, the 40 animal shapes -chickens, pigs, turkeys and rams – are shot off the rails, one at a time from left to right, from a freestanding position, within a prescribed period of time. With center fire silhouette matches, the shooter must knock the metallic animals off the rails at 200, 300, 385 and 500 yards, also from a free standing position and within a prescribed time frame. Rim fire silhouette matches happen every Wednesday evening from now until September. Center fire silhouette matches will be determined by the Section Head and interested participants. Come and check it out. 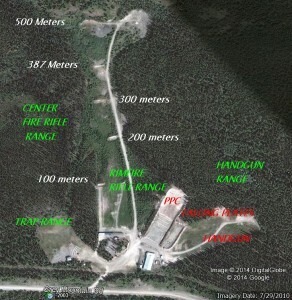 The Yukon Rifle Silhouette Championships will be held over the weekend of June 15th & 16th, so get out and practice!